Last week, I shared how I made a "raised bed" for my garlic by using a rake to pull the soil up into a mound that would do two things: give the garlic nice, deep, friable soil to grow in, and stop the garlic bed from being swampy by causing rainwater to drain out and around the bed. This week, I actually planted the garlic. I firmly believe that you must plant garlic in the fall in Ohio, sometime after the first hard frost but before temperatures are routinely below zero during the day. The key is to let the garlic grow enough to put down some roots, but not to get so much top growth that it will be killed back during the winter. This will allow it to shoot up in early March--garlic must have strong top growth before the weather gets warm or it will not set nice bulbs. 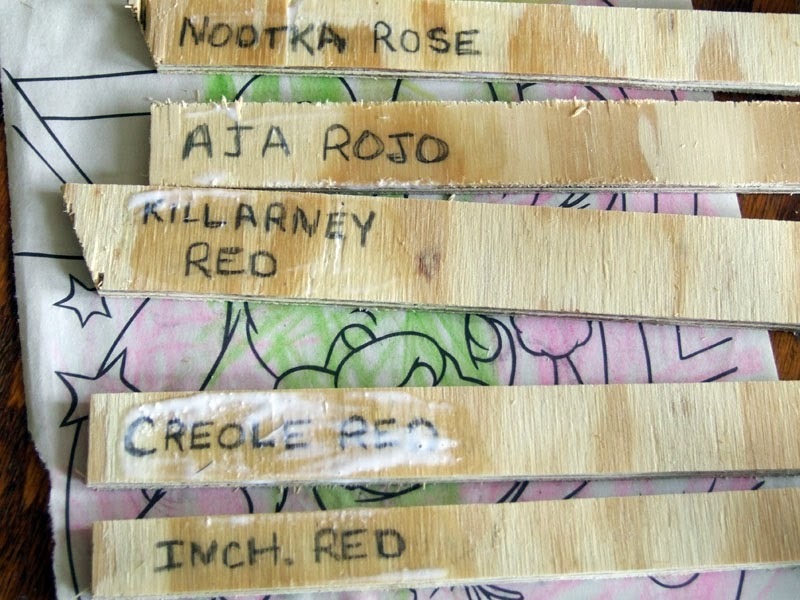 If you're going to plant more than one variety, you'll want to make plant markers. You'll need something that can come through the winter and still be readable in the summer. Plastic plant markers tend to crack, marking flags split and get brittle, and anything written in Sharpie will be gone before you know it, leaving you to make panicky guesses about what you planted where. I use scrap lumber cut into 1.5" x 12" lengths, and written on in pencil. You can also spray or paint on a weather-resistant top coat for extra insurance. Make sure your markers are done before you plant so you don't have to rely on your memory later. 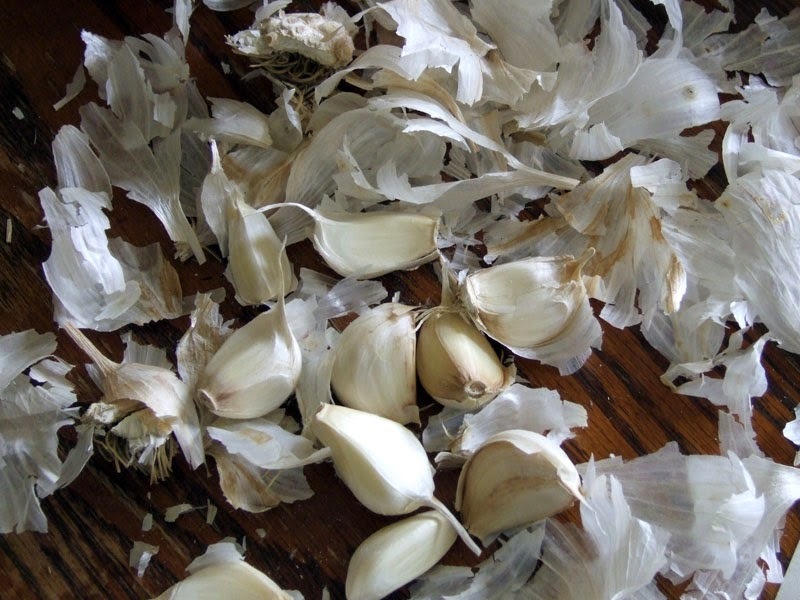 To plant the garlic, first break up each garlic head into individual cloves. Do this right before you plant them; garlic that is broken up early will not grow as well. Make sure that you keep each variety separate on the way out to the garden, of course. 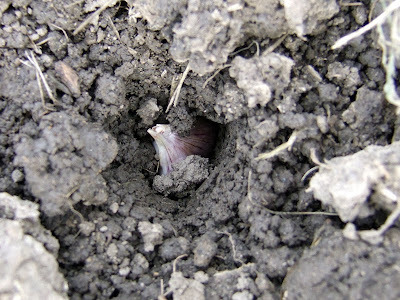 Garlic is planted point up, about 1-2" deep, and 5-8" apart, depending on your soil and the size of the head that the variety of garlic sets. I tend to plant all of it 5" apart, and have never had a problem. You can just shove the cloves into the loose dirt with your finger, but I've cracked a few that way and now use a dibble. A dibble is a fancy name for something long and skinny used to make planting holes. My dibble this year was one of my bits of scrap lumber. Poke a hole, push the garlic in with the basal plate down and point up, and move to the next one. Try to get the garlic in the ground as straight as possible so that the neck of the garlic bulb will be straight. Fill in your hole, plant the rest of the cloves, and you're done. 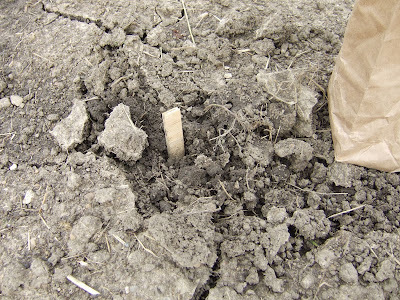 Cover the planting area with 3" of clean straw, and watch for little green shoots. Keep it weed-free, and there's nothing else to do until spring, when it will need to be fed with high-nitrogen fertilizer. I love growing garlic; it's not only delicious and nutritious, but I like seeing the green in the garden all winter long. I hope you enjoy growing it, too.